It's easy to lose sight of the little details in Destiny 2 as you try to grind your Power level up over 300. But Destiny 2 combat designer David Bocek made a compelling case for slowing down and really appreciating the world - in particular, the diverse enemies that try to make your Guardian's life as short and difficult as possible (you'll want to kill them before you can stop to admire them). When a Reddit user spotted the Cabal logo branded into the hind leg of a War Beast, Bocek followed up with some more details about the alien canine. 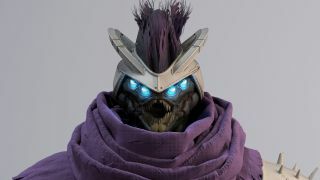 He didn't actually work on the design himself, being in Bungie's shooty-fighty-feel-good department; he's just a self-described "lore junkie" and a big fan of Destiny's artists. "Did you ever notice that when you shoot off the War Beast's helmet, you can see the tube openings that have been put into their head where they get their 'bane juice' (technical term) pumped into their brain to make them all crazy aggressive and such?" Bocek said. "The warbeast hide is also what the other Red Legion units use to make a flexible armor for themselves, which is why you can see it on their arms stitched onto the black padding and stuff around their joints." Bocek left a few more comments that underscored the struggle of the Fallen in Destiny 2. "For another example (on combatants at least): hard to notice without having them side to side, but the docking caps that the Fallen put on the Dregs have been removed in D2, and their [second set of] arms have started to grow back," Bocek wrote. "An element of their willingness to forgo their traditions, which shows that they are in a state of real desperation. Another response: "There's a lot of stuff still from D1 that I really like, like the Wire Rifle scope having 2 lenses since the Fallen have 4 eyes, but for D2 one neat addition to the Fallen (if I remember correctly) is that the Exploder Shanks are all busted up and broken looking. It's like they took a Shank that got beat up a bit, strapped some bombs to it and sent it out for the one last fight it had in it." I can only imagine the sorry scene back on the Ketch when a couple of Fallen dregs had to tell their Captain that they'd run out of Exploder Shanks. "They all exploded," the dregs must have chittered pitifully. Then after a four-armed beating they limped back to the workshop and started strapping bombs to the janky old Shanks that managed to survive their last deployment. A different kind of detail that may help you appreciate the game in the new light is Destiny 2's secret Strike intro about puppies. Yep, this game has layers.